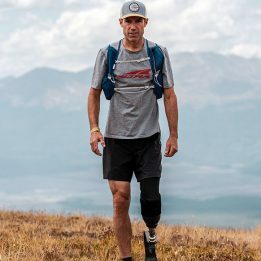 Jason Vaughan, 41, widely known as Ras, and who performs music under the name Jahson Ites, has become somewhat of a living folk hero in the Pacific-Northwest running community, and the only races he’ll likely ever win are the ones in which no one else participates. A tall, lanky, Rastafarian family man with waist-length dreadlocks who runs in red, yellow and green and lives in a cabin in the middle of sparsely populated, north-central Washington, he’s perhaps the best-known (and most-loved) “back of the packer” in the area. 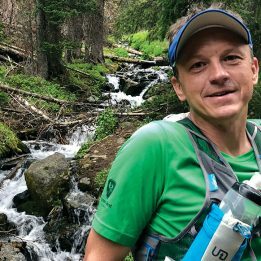 His motto is “An ultramarathon is like a mullet: business up front and party in the back,” and he has been making a compelling case the last few years that slower running is better running. He’s also at the front end of a project that is likely to intrigue ultrarunners and, well, just about everyone—establishing “Only Known Times” (OKTs) on almost incomprehensible solo endurance outings. Last summer, that meant running around Washington’s Mount Rainier semi-unsupported twice in one push (he picked up a food cache at the end of the first loop, and did have pacers for much of the second), and, recently, in early May, he ran Rim-to-Rim in the Grand Canyon six times, carrying all of his own supplies and finishing in 68 hours 10 minutes. I sat down to talk with him because the world needs to know about this man. Hey, Ras, how’s it going? Do your legs hurt? Things are wonderful. It’s a blessing to be alive. My head is still swimming with the immensity of the Grand Canyon project. It already seems unreal and is vanishing into the mists of projects completed. I didn’t have any pain afterward, just unbearably heavy exhaustion. Nothing hurts and I’m recovering well, but my legs are still blown out and rubbery, and will probably feel that way for a few weeks. What inspired your OKT project, and do you have any overall goals? On a big scale, my goal is to open up some of these distances, just to show that they can be done. Using my pacing and methodology, I keep finding I can do big, fun, non-standard distances—and do them safely, solidly and well, if not quickly. Beyond that my ultimate goal is to find what I can’t do. There was a time when a 25K was a question mark, because I had never run one before. I kept training and answered the 50K and 50-mile questions satisfactorily, so I asked myself the big 100-mile question. That was Cascade Crest 2011, and at the pre-race briefing Charlie Crissman said, “If you have never DNF’d, you need to enter harder races.” I finished Cascade Crest that year and the next, and still haven’t DNF’d. I keep upping the ante and imagining new challenges, but all I keep coming up with are things I can do. I’m on the quest for what I can’t do. Tell us about some of your other running accomplishments . I was one of only 12 people to finish the Angel’s Staircase 50-mile race the only year it was offered. Aside from Cascade Crest, I finished the Badger Mountain 100-mile two times, and the Lumberjack Endurance Runs 100-mile. I was also one of only nine people to complete the 2012 Pigtails Challenge 200-mile race, and will be returning again this year. In September 2012 I became the first person to complete the 93-mile Wonderland Trail around the base of Mount Rainier twice in a single push, once clockwise and once counter-clockwise. It’s got to be pretty cool to be able to finish a sentence that starts with “I became the first person to …” How have you decided on your OKT projects so far? The Wonderland Trail was a very organic choice for my first OKT project. My history as a backpacker and runner revolves around Mount Rainier. The first time [my wife] Kathy and I hiked the Wonderland, our daughter Angela was seven years old, and as a family it took us 19 days. We carried huge packs full of ridiculous amounts of gear. But we made it. And every couple of years the mountain has called us back. Each time we lightened up our gear, learned new techniques and simplified our approach. Then one day when I was contemplating the FKTs on the Wonderland, I was thinking about the choice of direction in which you run the trail. Clockwise offers steeper climbs and more runnable downhill sections and is generally considered the faster direction to run. I was thinking about specifically running it counter-clockwise to perhaps establish a separate time for the harder direction when it dawned on me: the only way to completely experience the trail would be to run it in its entirety one direction, then reverse direction and run it again. And the Grand Canyon Rim-to-Rim-to-Rim is a highly respected and classic testpiece. I think every ultrarunner is at least tempted by the idea of it. I imagined a way to do something uniquely fitted to my strengths on those trails. Greater than 100 miles is a realm I am comfortable in but which intimidates many more-talented runners. To me it just seemed ripe for the picking, and I thought that if I didn’t move quickly and get it done, someone else would do it. You’ve done a lot of solo running on these major projects–is it important to you that these things are done on your own, or is it just that no one else can fathom doing the things you’re doing? There is a scary purity in a long solo backcountry run. But on the Wonderland I did have friends running with me for almost half of the mileage, including two of the four nights. And I was going to run the Triple-Rim-to-Rim-to-Rim with a friend, but he turned his ankle on a shake-out run less than 48 hours before we were supposed to leave. But this is still kind of a breakthrough period where I am feeling out boundaries and learning possibilities. I love running solo through the night especially and am sure I will continue to do many solo projects in the future. I’m most excited, though, to see what sort of projects and distances Kathy and I can do together as a team, including some of the classic long trails. A lot of us have a hard time moving for more than a couple of hours at a time. Any tips or tricks you use to keep yourself going when you’re out moving for four days straight? Eating ginger can disrupt sleep patterns, so I eat crystallized ginger in hopes that it will do just that during nights. A favorite mental exercise is to ask myself, if my daughter’s life were in danger and the only thing that could save her would be to complete this distance, could I do it? And the answer is always, undoubtedly, yes. I can run. I can powerhike. I can walk. I can crawl. Whatever it takes. At that point I have to admit that I am physically capable of doing it, so it’s just a matter of motivating myself to do so. That line of reasoning takes “can’t” off the table. The question then becomes, how quickly or how slowly? Another mental game I use is to consider Sisyphus, the damned Greek who for all eternity had to roll a boulder up a hill, only to have it roll back down to be rolled up again. He’s the inventor of hill repeats. I take stock of everything that is going on at that low moment, the pain, the frustration, the sluggishness, the hunger, the thirst, and ask myself, If this was what I was doomed to do for all eternity under these circumstances, would it really be that bad? On long, steep climbs, when my legs are shot and I’m barely moving, I make a rule that I have to take 100 steps before I can stop. It might take a long time, but you can eventually grind out any climb by that method. Something that’s clear to a lot of us that know you is that you’re also a family man, sending messages of love to your wife from 115 miles in on these treks and so forth. What do your wife and daughter think of your shenanigans? My Empress Kathy is absolutely everything to me. She is my best friend and partner and teacher and lover. She calls me on my BS and challenges me in my weakness and laziness. We are each other’s Life Crew. She is the person responsible for getting me off the couch and outside. Fifteen years ago I was eating ridiculous amounts of cheese and sugar-laden processed foods, weighed 260 pounds and couldn’t hike a mile without suffering debilitating back pain. Kathy was the one who used to drag me up to Fragrance Lake (south of Bellingham) on day hikes and out into the North Cascades every weekend for overnight backpacking trips, and it was she who first had the idea of hiking the Wonderland Trail as a family. We have moved through thousands of miles of forest and wilderness together since then, and there is nothing more natural for me that to tuck in behind her on a trail and just move forward for days at a time. She totally supports my solo endeavors, but it’s running and fastpacking with her that I really love. The hardest thing about my solo adventures is being away from her. I know it’s a bit challenging for Angela, because she has exceptional woodcraft and backcountry skills. 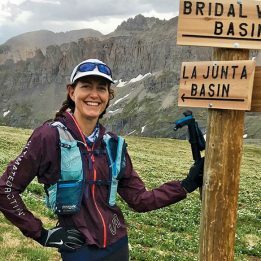 At 20 years of age, she has completed the Wonderland Trail five times, and has worked for years on trail crews for the Pacific Northwest Trail Association and the Forest Service. But it would be easier for her to establish her own bad-assedness if everyone else saw me for the giant goofy dork that she knows me to be. She is intimately acquainted with the man behind the curtain and is aware of all of his quirks, weaknesses and foibles. I know on some level the disparity between who she knows me to be and how others perceive me is frustrating and awkward to her. She is always supportive of my adventures. But the reality is that she is more responsible than I am, harder working, more dedicated, less rebellious, better prepared and overall a far better grownup than I am. I love her beyond words and am excited to see what she does with her life. Kathy seems to be doing a pretty amazing job at “challenging your weakness and laziness.” Somebody get her a job with Michelle Obama’s “Let’s Move” program. Childhood obesity = solved. Do you have any upcoming projects or plans? You announced the R2R2Rx3 just a couple of days before it started. Should we expect more surprises? I was a bit secretive about the Grand Canyon project because I knew it would be a prestigious achievement and I really thought it was low-hanging fruit. It think there are a LOT of people who could have done it both faster and in better style, so I didn’t want to shoot my mouth off ahead of time and give someone the opportunity to scoop me. But it will be fun to see those people come forward and show what can be done with the Triple Rim-to-Rim-to-Rim. It can probably be done in the 48-hour range under the right weather conditions. This season I’m fascinated with projects in the 130-mile range. That’s an intriguing distance, and pleasantly non-standard. I’ve already blabbed most of my projects for this year on my Altra Ambassadors profile page. A lot of what I’m doing this year is multiple loops. Running a trail two or three or four times in a go is a wonderful way to immerse yourself in a trail and its ecology. It’s big enough, intense enough and takes long enough that you get to experience living a portion of your life on that trail. You get to orbit through as a cog in the diurnal and nocturnal machinery of the wild. But 10 years from now I think people will look back on what I’m doing with a resounding “meh,” if not a “hurr durr.” I think it’s all well within what’s predictable and humanly possible. My self-promotional machinations aside, I wouldn’t expect to even be a footnote to the conversation. I tend to overthink things a bit. It’s probably better for everyone if I just shut up and run. You have a blog, a podcast and an Altra ambassadorship. Yes, I am an Altra Ambassador, although a few of us like to spell it “AmBadAssador”. OK, you’re an AmBadAssador, and you refer to yourself as UltraPedestrian. How would you describe your “brand” identity, and what would your logo look like? UltraPedestrian is it. That term sums it up so wonderfully for me because it’s all encompassing as far as forms and methods of motion go, and it’s a lot easier to say than run-walk-hike-jog-trek-and-occasionally-sit-for-a-few-minutes as a description of what Kathy and I do. And that blend is what I enjoy and what fascinates me. Bipedal locomotion. Hominid movement. It’s the very thing that distinguishes us from all the other mammals. For a logo I’m toying with the idea of a silhouette of a pair of running Sasquatches on a red, gold and green field. But I’m uncertain as to whether Kathy would find it flattering to be depicted as a lady Sasquatch, so it might be back to the drawing board. I think lady Sasquatches are hot, but everyone’s taste is different. Somewhere you said that “Slower running is better running.” Why so? My philosophy of running/adventuring/bipedalism is to use the most efficient, enjoyable and sustainable form of movement for reaching the specific goal in those specific environs. I occasionally do put up a respectable time. The first of my two loops on the Wonderland Trail last year would have been an FKT only a few years ago, for example. But for me it comes down to fast running not being sustainable running. Just like Nascar driving is not sustainable driving. A competitive runner may have only one or two goal races for the year, and they train and run according to that goal: putting up one or two outstanding performances a year. But I think most runners would rather run well a hundred times a year. From my experience, slower running correlates with fewer injuries and faster recovery, and is optimal for fat-based fueling versus carbohydrate-centric fueling. And enjoying running is key to it being sustainable. Our brains have receptors specifically designed to make running enjoyable, thus providing positive reinforcement, which begets more running. But I am not against fast running. I don’t think it’s wrong. I am as impressed and inspired by and in awe of the elite runners as anyone else, and I respect and admire them. What I take issue with is a culture that worships speed as the only standard by which to judge achievement. It’s time for Trail Culture to democratize running. You have dreadlocks, write and sing in a Reggae band and run in red, yellow and green. 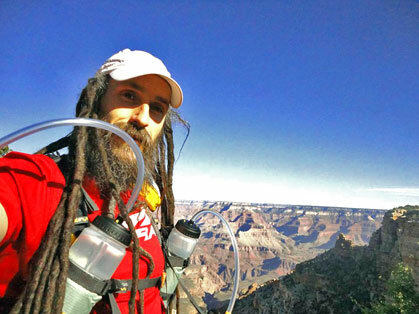 What does Rasta have to do with running? For me they are inextricably linked. The very language and imagery of Rastafari are rife with unrelenting foot travel. Life itself is referred to as a “trod.” Growing dreadlocks as an action of spiritual livication is called “carrying locks.” “Forward Ever, Backwards Never” is not only a fundamental ideal in the Rasta worldview, but also a simple, apt and penetrating ultrarunning mantra. I am a Rasta Person and a runner, and each aspect permeates the other. Living Rastafari is my high aim in life, and that applies to my running as well as other facets of my life. 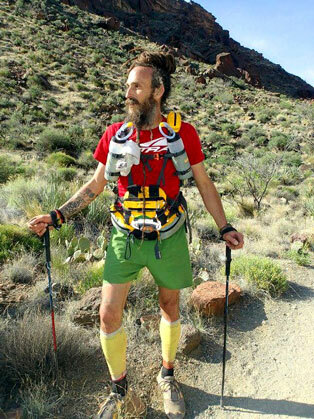 It’s funny because in the trail-running scene people see me with my locks down and have that impression of me, but that’s not normally how you would see me. In a city or around town or traveling I usually have my locks coiled on top of my head and sealed in a turban. But the weight of it is too much when I am running. My hair is heavy and can be uncomfortable and awkward. It wouldn’t be worth it if it were just a cool hairdo. But my locks are a literal outgrowth of my spirituality. In the 1963 Coral Gardens Massacre untold numbers of Rastafari People were murdered and buried in the jungle by the Jamaican army for being outwardly identifiable as Rastafari. I know elders who survived that time and carried their locks at the risk of their very lives, so it is easy, and an honor, for me to carry my locks through a small amount of inconvenience and sweat. Oh, man, that’s funny. Although, if you think about it, “Healthy people consistently achieving their goals,” isn’t exactly the recipe for reality-TV gold. I don’t think Kathy and I would generate enough drama to carry a typical reality-format show. But if a show like that could be used to encourage people to push a little beyond their comfort zones and see past their perceived limitations into the infinities of possibility, then sign me up. Thanks so much for answering my questions. It probably won’t have as big of a cultural impact as The UltraPedestrian Life™ reality show would, but hopefully this interview will introduce a few folks to your ongoing project and inspire them to try some things that they previously thought were impossible. Ras is a blogger and podcaster with his wife Kathy at UltraPedestrian.com. The full account of his sextuple-Rim-to-Rim run can be found here. The music of Jahson Ites is available from www.sickdonkeyrecords.com and on iTunes. Tim Mathis is a runner in the Seattle area, and blogs at alittlerunny.blogspot.com. His music is occasionally available at karaoke bars on Friday nights in Seattle’s International District.